Seller wants offers! This 4/3 home offers all that makes Bird Key special – a large lot with southern exposure (15000 s.f. 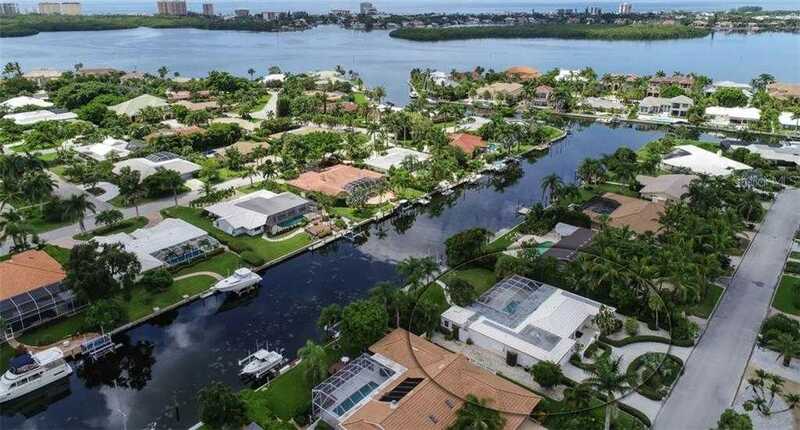 ), great boating water, dock, lift, a double jet ski dock, pool, spacious outdoor entertaining area, quick access to the boutique shopping and fine dining of downtown Sarasota and St. Armands Circle and the sands of Lido Beach for under $2M! Or tear down and build your dream home! The one hundred foot wide canal means great views and lots of room for your boat and other toys. The Sarasota Bay is just a minute boat ride away. From the circular drive you enter into this comfortable, casual and open 2400 square foot home. The master bedroom offers two walk-in closets with built-ins. The master bath has dual sinks and a large, glassed shower. The sliding doors in the master lead out to the 1800 square foot patio and pool. The kitchen is open and looks out over the living and dining areas. Two sets of sliding doors in the living room allow gorgeous views of the pool and canal. Two guest bedrooms are opposite the master. An unexpected surprise is the fourth bedroom, en suite, that has its own private entrance off the patio. Perfect for visitors, in-laws or a private, quiet home office. Steps from the front door is the Bird Key Yacht Club. Membership means access to their numerous social activities, use of the fitness center, tennis, golf, swimming pool – the list goes on! Bird Key is a magical place – come see it today! Please, send me more information on this property: MLS# A4413388 – $1,475,000 – 390 Bob White Dr, Sarasota, FL 34236. I would like to schedule a showing appointment for this property: MLS# A4413388 – $1,475,000 – 390 Bob White Dr, Sarasota, FL 34236.